You don't need a large diamond to make a ring stand out! 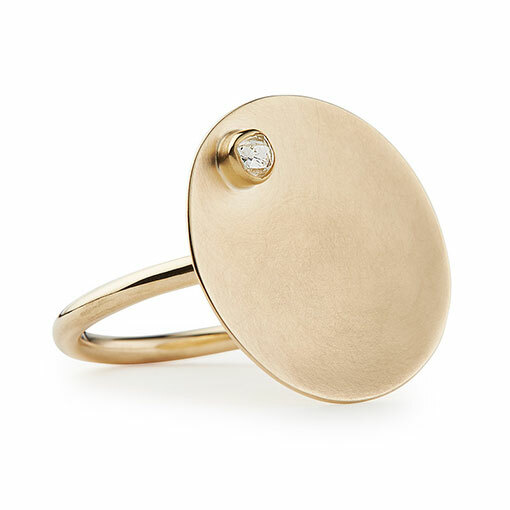 Barbara Cotter's Tilt ring features a small uncut marine diamond in a rub-over setting on a substantially sized circular 9ct yellow gold centrepiece, it examines the concept of space, geometry and beauty. Her work also explores the physical and emotional experiences of life; that emotions have a physical echo in the body and this is reflected through the subtleties of form, texture and colour. Barbara places greater emphasis on the relationship between the wearer and the adorned object, making its wearability just as important as its aesthetics. Labels: barbara Cotter, diamond, Geometric, Modern Ring, Rock it!